This is an essential tool when cooking in a camp Dutch oven. The "T" bar design comes in handy when moving Dutch ovens from fire to table. 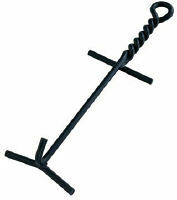 Heavy-duty steel with high temperature black finish. The lid lifter keeps you from getting burned so you can enjoy outdoor cooking.